Susan has held many different events at Market Alley Wines to help fund raise for local organizations. During the beer and whiskey tastings she asks for a free will donation, with proceeds benefiting United Way, the Jamieson Center, and the Backpack program for area students. She auctioned off a ten year old bottle of Rip Van Winkle Whiskey in November, 2015 and was able to donate more than $300 to the Western Illinois Animal Rescue. Also in November, 2015 she held a wine tasting event to raise money for the St. Jude's runners who participate in the Galesburg to Peoria run. The participants in the St. Jude's Run between Galesburg and Peoria held a wine tasting event to help raise money for their cause. St. Jude's, a children's research hospital, has treated millions of children from across the United States and 70 other countries. It is because of the fundraising done by teams around the world that St. Jude's is able to support these children and their families through the toughest times of their lives. The Jamieson Center supports families from the Monmouth community and surrounding areas. 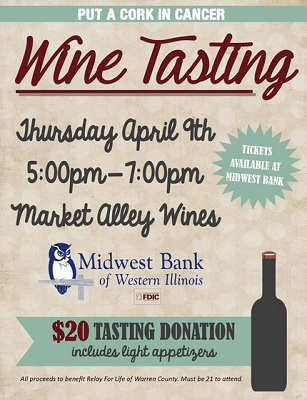 Market Alley Wines hosted as wine tasting in April, 2015 to raise money for the Warren County Relay for Life. 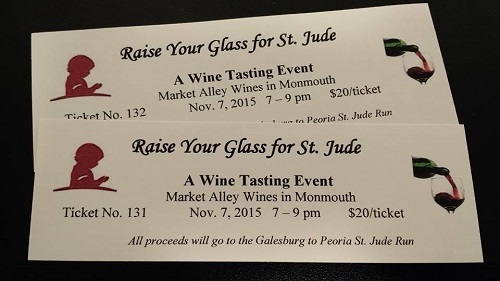 Tickets from the St. Jude's Wine Tasting which helped raise money for the Galesburg to Peoria run. 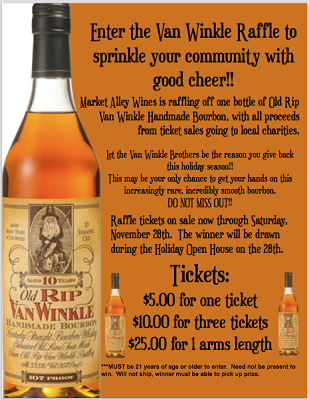 For their holiday open house, Market Alley Wines auctioned off a bottle of ten year old Rip Van Winkle whiskey with proceeds going to the local animal rescue shelter. 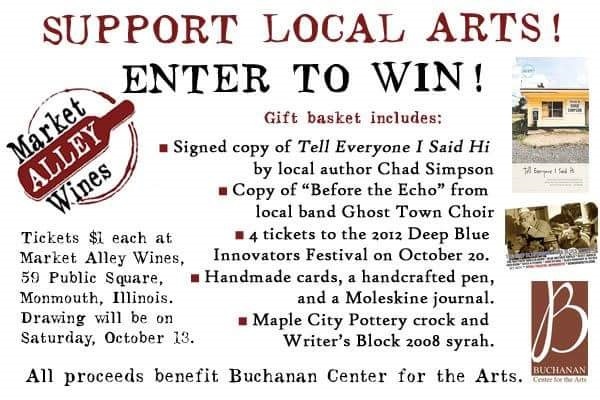 Market Alley Wines put together a gift basket to help raise proceeds for the Buchanan Center for the Arts in Monmouth. 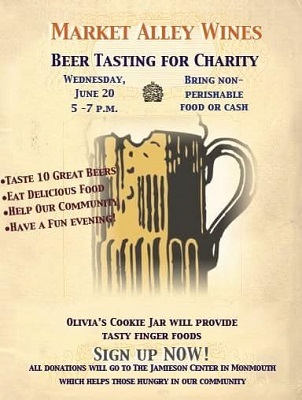 Market Alley Wines hosted a beer tasting night which help raise money to support the Jamieson Center.